Home Breeds What Kind of Dog is Scooby Doo? It's common knowledge that Snoopy is a Beagle and Lassie is a Collie. But the genealogy of another famous cartoon dog isn't as clear. So if you're one of the many who is bamboozled by Scooby-Doo's pedigree, and got thinking “What kind of dog is Scooby Doo?,” then this article is for you. Scooby Dooby Doo: What are You? A quick trip to the internet reveals that Scooby-Doo is a Great Dane. One look at Scooby-Doo might have you shaking your head and wondering how he can possibly be labeled a Great Dane. His creator, Iwao Takamoto, made it clear that Scooby's looks were not an accident. Rather, he insisted that drawing him big and clumsy provided more comic opportunities. 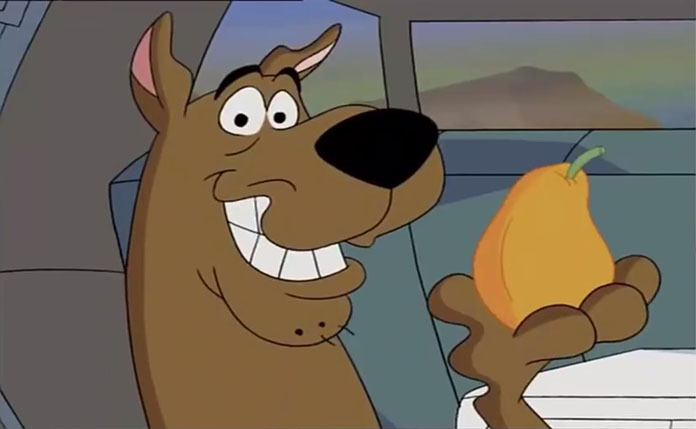 Scooby-Doo is the canine life partner of Shaggy, one of four characters that also include Velma, Daphne, and Fred, who travel around in The Mystery Machine, a van that was in the wrong line when subtle paint jobs were distributed, investigating eerie occurrences. Most of which turn out to be Old Man (insert any generic last name here) who was pretending to be a ghost haunting the (insert name of inn, museum, farm or other location) in order to keep it from being (sold, renovated, torn down, insert similar action). The character known as Scooby-Doo was pitched as a Sheep Dog named Too Much, because of his creators, Joe Ruby and Ken Spears, feared their original idea of a Great Dane would be perceived as being too much like the comic strip character Marmaduke, to whom Scooby-Doo bore a remarkable resemblance. Fred Silverman, the executive in charge of daytime programming for CBS initially rejected the Sheep Dog idea, and it wasn't approved until the dog went back to being a Great Dane. 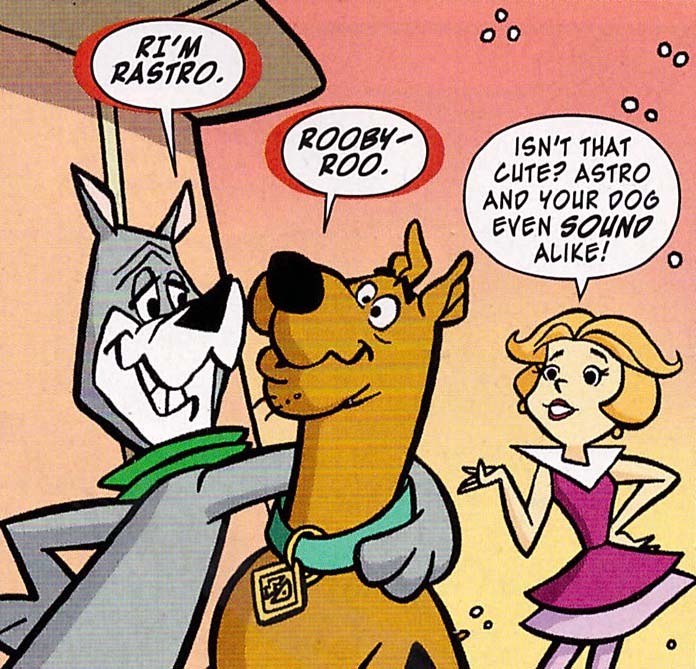 The comparison to Marmaduke isn't Scooby-Doo's only link to another comic canine. The original series, Scooby-Doo, Where Are You!, which was created by Hanna-Barbera Productions, debuted in 1969 and has been around in some form or another since then. But years earlier, in the Fall of 1962, Hanna-Barbera rolled out a prime time animated series, The Jetsons. The primary characters in the short-running (one season) program starred George Jetson, Jane, his wife, daughter Judy and his boy, Elroy. The Jetsons lived in a futuristic world of food pellets and flying cars, but as a typical American family, they also had a dog – Astro. Sound familiar? It should. It's the exact linguistic challenge we hear when Scooby-Doo speaks. And here's the kicker: Not only did Hanna-Barbera produce both shows, but the voice for each of the dogs was provided by the same man: Don Messick. Now, I don't want to stir up any controversy, but I'm just saying it's possible that Scooby-Doo and Astro are the same dogs. As a big fan of the Law & Order franchise, who was also a loyal follower of HBO's Oz, I've seen this very thing happen time and time again on L&O shows. Someone who was a violent, sociopathic killer on Oz appears as a good guy on L&O: SVU or Criminal Intent. Doctor Skoda was a sadistic, Nazi skinhead on Oz (he's also the voice of the yellow M&M), Elliott Stabler was a somewhat scary inmate who loved his cellmate and also happened to be a sociopathic killer, and Dr. Huang was a priest. And I think that may also be what happened in the Scooby-Doo world. Like the Law and Order/Oz crossovers, there were people who'd worked in both worlds. Hanna and Barbera produced each cartoon and Messick had already proven himself capable of channeling his inner canine, so it's not much of a stretch to think that the producers decided to cast a known quantity as the big, goofy dog, Scooby-Doo. How would you react if, like Scooby-Doo, your dog suddenly started talking? Would you freak out or welcome the chance to chat with your pooch? What's the first thing you'd ask him? Thanks for this great post! Scooby is a Great Dane. When I was little, me and my brothers watch Scooby Doo and his gang. Scooby Dooby Doo where are you? The song and Scooby reminds me of my childhood.